My wife sometimes pretends that there’s something wrong with me, mentally, because of my muSICKal choices. Then I beat her up when playing Abruptum out loud, but actually she might be right. You know, I have never hidden my appreciation for Cody Maillet and his Cryostasium outfit, so that might be a proof of my dear wife’s statement, I guess. No, just kidding, I do not beat her (she’s too strong for me), but I am not kidding when saying that I do like Cryostasium (or other outfits Cody’s involved with, such as CTM, which is a project that includes his brother Thor, or Bone Ritual, Witch Tomb and so on). Enter the guy’s name, or the moniker of one of those projects, to find some reviews I did for him / them in the past (amongst which a cool split with Abigorum, which is a solo-project by Satanath Records’ label owner Aleksey). A while ago, Japanese anime stuff entered the world of Cryostasium, and with Project:00 this trend continues. In the first place, there’s the artwork, taken care of by Anko and Petridisch. It’s as funny as it is serious. Actually, this EP sort has been done before by Petridisch / Cryostasium, with quite the same cover artwork, just in different coloured concept. Nuts, I hear you think? Nuts indeed! Besides, both American artists (Cryostasium and Petridisch) did work together several times before – check out their Bandcamp-pages to learn more. 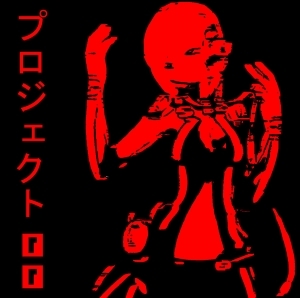 At least as important for that Japanese thing is the vocal assistance of the Vocaloid figure Meiko (like Hatsune Miku, another previously assisting creature), which co-operated spontaneously for several times in the meantime. Meiko sings, you know…, being as beautiful as unreal. Funny, ingenious, or just mentally troubled? This six-tracker, which lasts for about twenty-one minutes, is another typifying Cryostasium experiment. It is Black Metal and Japanoise, Drone and Ritual stuff, all in once. The basics are an unstoppable Black Metal machine, with furious drum blasts, sharp string melodies and deep bass lines. It’s harsh, industrialised and merciless. This gets injected by several unhuman elements. Of course there are those programmed voices, as aforementioned. Then you have these electronic injections and post-astral synth devices (cf. Downward, accompanying you to a Hell in Outer Space), some wretched screams, all this veiled in an asphyxiating mist, twisted and neurotic, lunatic and necrotic. A few parts are focusing especially, and more deeply, on the Black Metal thing, and in a subjective way pieces like Suspended In Ether (including quite simplistic yet perfectly used bells!) do carry my preference for that matter - but the whole thing is abyssal and coal-black in essence.